Im September 2016 wurde die Haftstrafe gegen die iranische Journalistin Narges Mohammadi, die im Mai von einem Revolutionsgericht in Teheran verhängt wurde, von einem Berufungsgericht bestätigt. Sie war zu fünf Jahren Gefängnis verurteilt worden wegen der angeblichen Bildung einer „konspirativen Vereinigung zur Begehung von Straftaten, welche die nationale Sicherheit gefährden“. Ein weiteres Jahr Gefängnis hatte sie für die „Verbreitung regierungsfeindlicher Propaganda“ erhalten und noch einmal 10 Jahre wegen des Vorwurfs der „Gründung und des Betriebs einer illegalen Organisation“ für ihre Arbeit mit Legam, die sich gegen die Todesstrafe richtet. Nach den Bestimmungen des iranischen Strafgesetzbuches von 2013 muss eine Person, die zu mehreren Haftstrafen verurteilt wurde, die Haftstrafe mit dem höchsten Strafmaß verbüßen. Da das Urteil in der Berufung nun bestätigt wurde, bedeutet dies zehn weitere Jahre Haft für die Journalistin. Narges Mohammadi, die sich in einem schlechten gesundheitlichen Zustand befindet,verbüßt bereits eine sechsjährige Haftstrafe wegen ähnlicher Anschuldigungen. Der internationale PEN fordert die sofortige und bedingungslose Freilassung von Narges Mohammadi, da sie lediglich wegen der friedlichen Ausübung ihres Rechts auf Meinungs- und Versammlungsfreiheit festgehalten wird. Unternehmen Sie etwas! Teilen Sie den Artikel auf Facebook, Twitter und in anderen sozialen Medien. Rufen Sie die iranischen Behörden dazu auf, die Journalistin Narges Mohammadi unverzüglich und bedingungslos freizulassen, da sie lediglich wegen der friedlichen Ausübung ihres Rechts auf Meinungs- und Versammlungsfreiheit inhaftiert ist. Drücken Sie ihre ernste Sorge wegen der Gesundheit und des Wohlergehens von Narges Mohammadi aus und verlangen Sie in aller Dringlichkeit, dass sie jede erforderliche medizinische Hilfe erhält. Fordern Sie die Behörden dazu auf, Mohammadi Telefonate zu erlauben, damit sie mit ihren Kindern sprechen kann. Fordern Sie die Behörden außerdem dazu auf, sicherzustellen, dass das Recht auf Meinungsfreiheit im Iran sowohl in der Rechtssprechung als auch in der Praxis respektiert wird, so wie es in Artikel 19 des UN-Zivilpakts festgeschrieben ist, zu dessen Unterzeichnern der Iran zählt. @khamenei_ir @HassanRouhani Defending human rights is not a crime – #Iran must release #NargesMohammadi now! Narges Mohammadi is an independent journalist and the former vice-president and spokesperson of the Defenders of Human Rights Center (DHRC), which advocates for human rights reform and represents political prisoners and prisoners of conscience in legal proceedings. She is also involved in campaigning against the death penalty in Iran. Mohammadi has long suffered from persecution at the hands of the Iranian authorities; she has been banned from travelling abroad since 2009, when the authorities confiscated her passport. 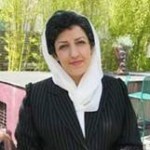 The following year, Mohammadi was arrested from her home without a warrant and held in connection with her work with the Defenders of Human Rights Center. Immediately following her release on bail on 1 July 2010, Mohammadi was admitted to hospital for treatment. PEN International first began working on her case in 2011 when a Tehran court convicted her of ‘acting against the national security’, ‘membership of the DHRC’ and ‘propaganda against the regime’ for her reporting on human rights violations, cooperation with Nobel Laureate Shirin Ebadi and visiting political prisoners (see RAN 20/12 and updates). She was sentenced to serve a cumulative sentence of 11 years in prison. The sentence was reduced to six years on appeal in January 2012. On 21 April 2012, Mohammadi was summoned to Evin prison to serve her sentence. She was released on bail on 30 July 2012 following the severe deterioration of her health. In May 2015, Mohammadi was arrested days after a fresh trial began on charges including ‘spreading propaganda against the system,’ ‘gathering and colluding to commit crimes against national security’ and ‘membership of an illegal organisation whose aim is to harm national security’ (Legam – Step by Step to Stop the Death Penalty, an organisation that campaigned against the death penalty in Iran) which had been brought against her in June 2014. At the time of her arrest, intelligence officials are reported to have said that she was being arrested to continue serving her six-year sentence. Her trial was subject to several postponements without any explanation provided by the court. Mohammadi stood trial on 20 April 2016. According to the Defenders of Human Rights Center, the verdict was communicated to her lawyer on 17 May 2016. Mohammadi was sentenced to five years in prison for ‘gathering and colluding with intent to harm national security’, one year in prison for ‘spreading propaganda against the system’ and 10 years for ‘establishing and running an illegal organisation’ for her work advocating against the death penalty. Under legislation adopted in 2015, a person sentenced to several jail terms is required to serve that with the most severe penalty – in this case, 10 years, which will be added to her previous six-year sentence. Evidence used against Mohammadi included media interviews she had conducted, her connections to human rights defenders, as well as her activities against the death penalty, including her work with the campaigning group, Step by Step to Stop the Death Penalty. It also included her meeting with EU High Representative for Foreign Affairs & Security Policy Catherin Ashton in March 2014. On 19 September 2016, Mohammadi attended Branch 36 of Tehran’s Appeal’s Court in order to present evidence against the preliminary sentence; however, she was informed that the court had already reached its verdict, according to the International Campaign for Human Rights in Iran. Mohammadi suffers from a neurological disorder that can result in seizures, temporary partial paralysis, and pulmonary embolism – a blood clot in her lung. Serious concerns for Mohammadi’s health persist following reports that she suffered several seizures in August and October 2015. According to reports, Mohammadi was taken to hospital on each occasion and on at least one instance she was returned to prison against medical advice. In a subsequent incident she was handcuffed to the bed for the first few days of her hospital stay. According to reports, Mohammadi now faces an additional charge of ‘insulting officers while being transferred to a hospital’ after she filed a complaint with regards to the treatment she experienced at the hands of prison guards when she was transferred to hospital for examinations. Mohammadi is the mother of nine-year-old twins (born in November 2006), and isthe wife of prominent journalist and activist Taghi Rahmani, who has spent a total of 17 years in prison. Taghi Rahmani left the country in May 2011 following escalating pressure from the authorities. Their children joined him in July 2015. She is an honorary member of Danish PEN and Belgian PEN. In May 2016, she wrote a moving letter to the PEN community, calling on the PEN membership to take a stand against the use of solitary confinement as a means of torture. In September 2008, Narges Mohammadi was elected as President of the Executive Committee of the National Council of Peace in Iran, a broad coalition against war and for the promotion of human rights. She has campaigned for the abolition of the death penalty in Iran, and is the recipient of both the Alexander Langer Award (2009) and the Per Anger Prize (2011) for her human rights work. She was one of awardees of the 2013 PEN/Oxfam Novib Free Expression Award. Dieser Eintrag wurde veröffentlicht in Rapid Action Network von Writers in Prison. Permanenter Link des Eintrags.